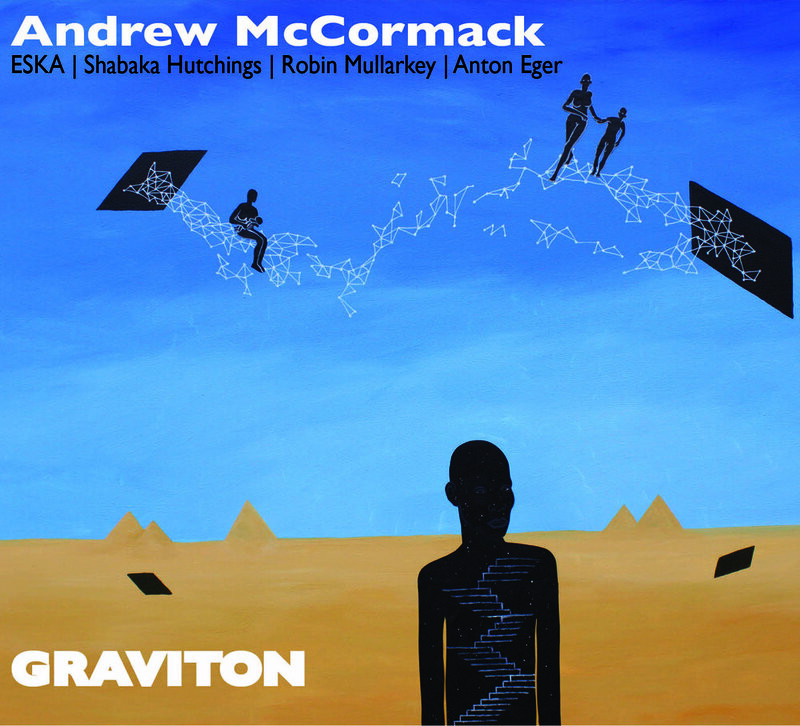 For his new project Graviton, Andrew McCormack assembled a formidable cast list of collaborators including MOBO winner Shabaka Hutchings, Mercury Prize nominated vocalist Eska and the irrepressible Anton Eger on drums. It should come as no surprise then, that the music is exploring very different territory to previous releases under his own name. This is an ambitious project, melding together ideas and styles from across the musical spectrum. The centre of gravity hovers somewhere around the looping, pulsating vibe of electronic dance music, translated to a live performing band with dollops of prog rock like riffs, and diversions into almost orchestral soundscapes including at one point a multi-tracked choir of Eskas. Rob Mullarkey’s fat, grooving bass anchors many of the fizzing, switch-back, alternating rhythms and the vibes of Ralph Wyld and Noemi Nuti’s harp add colour and atmosphere. Breathe’s riffy, melodic motif carried mainly by Eska’s wordless vocal, is underpinned by shifting sections of rhythm, from a looping piano figure, followed by a crunching rocky riff, then a sparse drum and bass groove, then a meaty bass line before a climactic moment with the whole band, Hutchings’ sax lines locking in. Graviton races along on more bubbling piano figures with bass and drums locked into the rhythm, layers of sinuous melody on top. Kalamata has a lighter funky groove tinged with a rocky edge and moments of thunderous chords under Eska’s soaring lyric. There’s glittering burst of McCormack’s keyboards in the middle. The Waiting Game foregrounds the lyric with a slower, balladic pulse whilst Andromeda, replete with that choir of Eska’s, is meditative and atmospheric. Fellowship hurtles along with an infectious boogying rhythm and some vintage Hutchings rhythmic playing. Escape Velocity has another snappy bass groove and looping figures before McCormack lets fly with a blistering solo. The Time Delay of Light closes the set with another atmospheric ballad slowly building to an anthemic crescendo. This set showcases McCormack’s imagination as a composer and arranger as much as his inventiveness at the keyboard and it’s quite a trip.